Cognitive Vision's flagship product is the CV300 DynamicPRO signal analyzer. This high-speed multi-channel FFT spectrum analyzer continues to meet or exceed your vibration and sound measurement needs, and represents over a 30-year evolution in analyzer technologies. When high real-time rate, FFT analysis and cross property measurements are needed, the CV300 is the unit of choice by skilled operators, technicians, and design engineers worldwide. The unit is housed in a rugged, portable light weight enclosure. It can operate from either external AC power or an internal battery system for over eight hours. Orbits, balancing, transfer function, correlation, and octave displays are crisply presented, and data are stored in a format that allows for rapid report generation. Inputs for acceleration, velocity, and displacement signals are properly conditioned, and either differentiated or integrated into other units. Additionally, normal mechanical impedance functions are available for both rotational machinery and structural (modal) analysis tasks. There is yet to be a dynamic sensor invented that the CV300 DynamicPRO signal analyzer cannot accommodate, and it can extract more information from your sensor's signal than any other measurement system available. 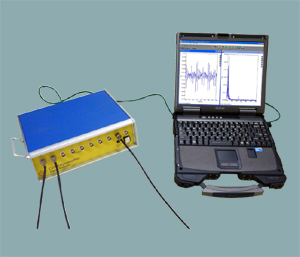 This versatile instrument have been used in a wide variety of data acquisition and import applications including rotating machinery, noise and vibration analysis, acoustics, thermal and structural analysis, electronic and biochemical measurements, forensic analysis, and physical testing. This single instrument will rapidly become your most valuable diagnostic asset (review data sheet). Shouldn't your shop own one today?